I have seen this is now a Rezerwat przyrody, how can I now get to the end of the bay, there ist a very nice camping wirh a good jetty? Camping Kruska? Nad Zatoka? Horatio, in my opinion only in the northern part of Zatoka Wygryńska was Quiet Zone, but not Nature Reserve. 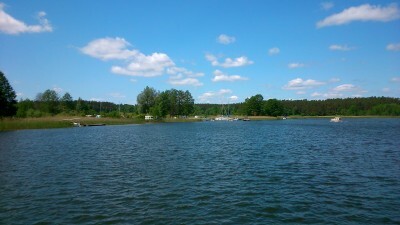 Anyway, you can reach Camping "Nad Zatoką" (formerly "Kruska") in your boat without any problem and/or restriction. Dear Sir, thank you very much for this nice picture, I have been here for a lot of times, but now I see in the map a big green border around this bay, like on the Lake Niedzkie. ... but now I see in the map a big green border around this bay, like on the Lake Niedzkie. On which map you have seen such marking ?? Horatio, marked on this map "Zatoka Wygryńska" and "Grąd Wygryny" are not Nature Reserves but only so-called Ecological Areas... so you can still visit Camping "Nad Zatoką" in your boat without any problem. Thank you very much indeed for your kind help. Would you please so kind to explain me the different between "Nature Reserves but only so-called Ecological Areas". Are there any charts on which I can see that? What is Nature Reserve, you know very well. Ecological Area is also one of the forms of nature protection in Poland. The reason for creating Ecological Areas is necesitty to protect small surface areas, but valuable in terms of nature. Such areas can not be protected as Nature Reserves because of their small size and usually lower rank of nature values and arrangements for their active protection or prohibitions are not as strict as for Nature Reserves. - Czarcia, Pajęcza and Szeroki Ostrów on Śniardwy Lake. Thank you again very much indeed. I read that the skippers leave a lot of refuse on this islands on Czarcia, Pajęcza and Szeroki Ostrów on Śniardwy Lake. And the mouses jump on the boats? Unfortunately, such is the reality. Since many seasons I have stopped visiting Czarcia and Pajęcza islands because of their pollution. I'm not even intent to - my friends still keep informing me what's going on this islands in the summer season. But it is still a Ecological Area? Law and Order? Yes, this is still Ecological Area. We have the best environmental law and we have the worst enforcement of its observance. Horatio... This is Poland ! I'm sorry Horatio, but I was wrong. On the basis of Regulation No 9 of Warmia and Mazury Province Governor dated 26.01.2006 regarding Mazurian Landscape Park, in Wygryńska Bay use of motor boats is prohibitted. In this situation you can not reach Camping "Nad Zatoką" (formerly "Kruska") in your motor boat. Thank you for your information. In this Bay there are 3 Marinas, how can this boats enter they Marinas? ... In this Bay there are 3 Marinas, how can this boats enter they Marinas? Horatio, looking at the maps attached to Protection Plan of Mazurian Landscape Park, part of Wygryńska Bay, where these ports are, is excluded from the area where use of motor boats is prohibitted (see map of Section 16 of Masurian Landscape Park below). But from the other hand in Regulation No 9 of Warmia and Mazury Province Governor dated 26.01.2006 regarding Mazurian Landscape Park is clearly written that use of motor boats is prohibitted in whole Wygryńska Bay. Horatio... this is Poland, here nothing is simple and easy !